The Bible says you're a fool if you claim that God does not exist (Psalm 53:1 ESV). (And none of that nonsensical redefinition of atheist to "someone who lacks belief", that's not the established definition, old son. I lack belief in a universe without God.) God isn't just being insulting, but let's face it, you may be brilliant in comparison to other people, but in comparison to God, you're nothing. More than that, the word translated "fool", נָבָל, is not just lacking intelligence, but someone of low character that mocks God. Hold on there, Pilgrim! 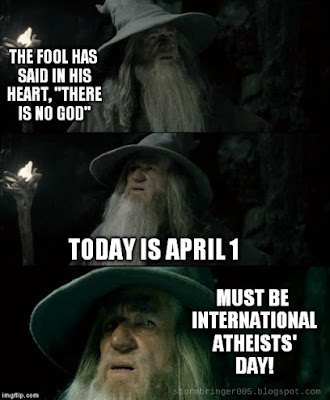 Don't get the bit in your teeth and think it's all right to go wild by calling every atheist you meet a fool. See the first part of the verse? Although it applies to those who deny God's existence, there are Christian fools as well! That's right. Christians profess to know God, but some think that they can get away with sin and defy him; they are saying in their hearts that there is no God. Better repent of that attitude right quick. 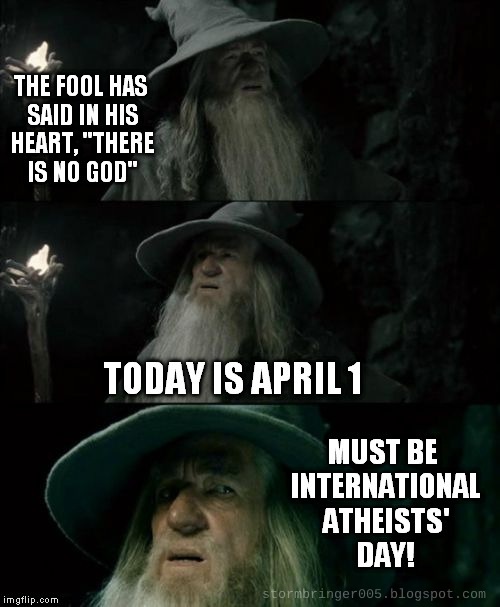 Back to the atheist issue. Elsewhere, I offered some opinions on why people become atheists. Some of it is "bandwagon" atheism, trying to be trendy and shock parents. Many will give the impression (or even say outright) that they spent time examining issues and searching for evidence, then intellectually decided that God does not exist. That's downright silly, because there is abundant evidence for God's existence. Further, the Bible has an explanation for the condition of the world — atheism does not have the necessary preconditions of human experience, and has a problem with morality. Some atheists are pretty doggone arrogant and seek to not only ridicule the Bible and mock Christians, but to destroy our faith so we can be as much sons of Hell as they are. Here's one that really takes the rag off the bush. 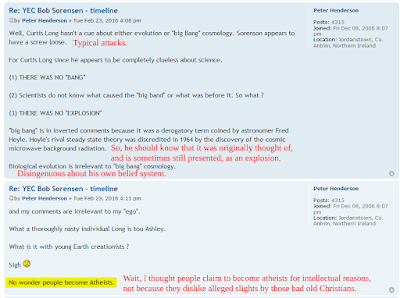 This tinhorn does not understand the history of the Big Bang, pulls that falsehood that the Big Bang has nothing to do with evolution (Carl Sagan said, "We're all star stuff", and someone else said, "A star died so you might live", or words to that effect), uses ad hominem attacks, and so on. 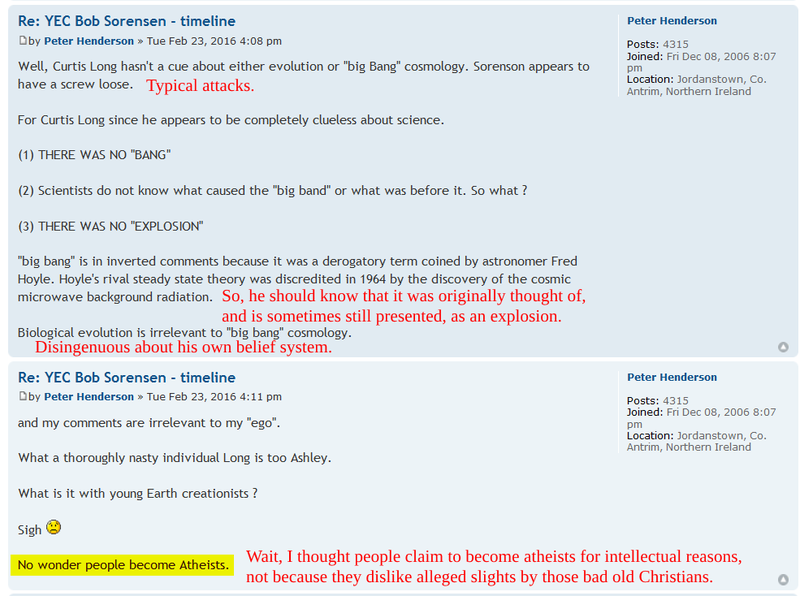 The best part is at the end, where he indicates that people become atheists out of spite. Right, if a Christian says something he doesn't want to hear, or he just doesn't like the Christian, then he could become an atheist and it's all your fault, you big meanie! Where I come from, people are responsible for their own choices. If a professing Christian is unkind (whether for real or because someone has a burr under his saddle and wants to find an excuse to be "offended"), choosing atheism as a punishment for God, the Christian, all Christians — wow, that's dumb. He's a fool, looking to justify his rebellion against God. What it all comes down to is that people do know that God exists (Romans 1:18-22), but suppress the truth. They need to repent while there's still time. Jesus died on the cross for our sins, to give us salvation, to reconcile us to God, and he defeated death by bodily rising from the dead on the third day. Oh, you think we are the fools because we reject atheistic "reasoning"? As the Petra song says, "I'd rather be a fool in the eyes of man than a fool in the eyes of God".